I don’t take risks, even with two feet planted firmly on the ground. I don’t stray far outside of my comfort zone, which doesn’t extend far beyond home. 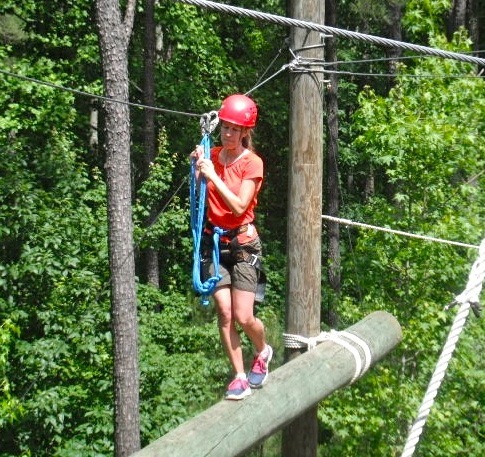 So when a friend invited my husband and me to a ropes course, I decided I needed a change. I would sign up and worry about panic later. 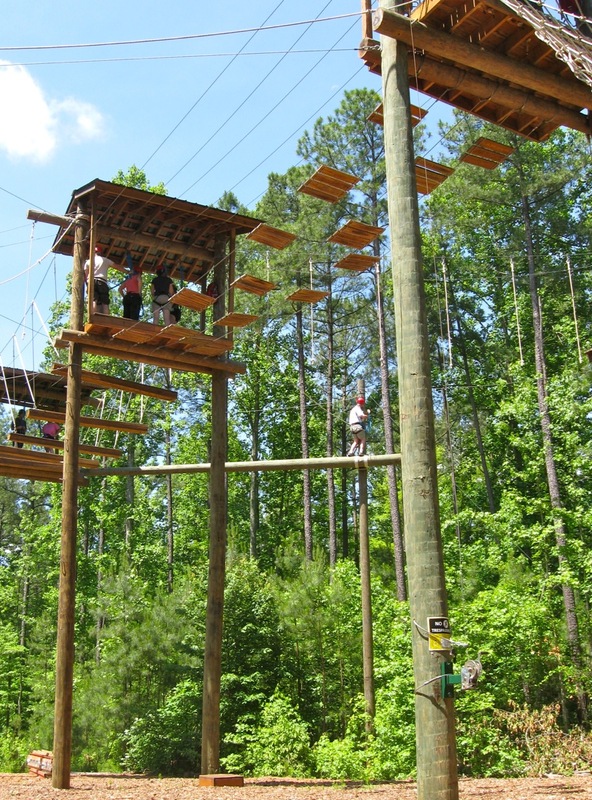 When I learned the ropes course was forty feet in the air, I tried not to think about it even though I have an extreme fear of heights. I once froze in the middle of a climbing net at a children’s museum, panic locking my ability to breathe or rationalize the fact I was wallowing in millions of germs. When I admitted I was nervous about my upcoming adventure, my daughter couldn’t understand why. 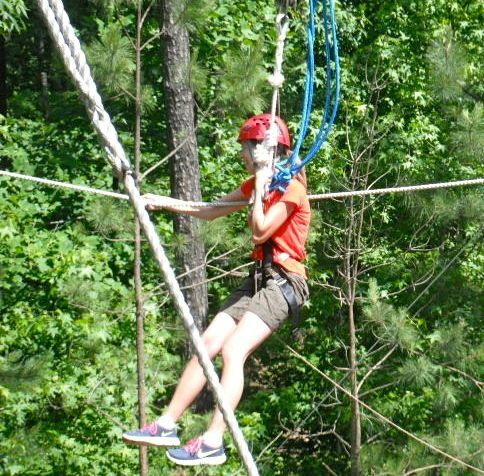 In her seven-year-old mind the ropes course looked like a midair playground. She never knew I was afraid of heights. Immediately she coached me. Well now I had to do this. As I climbed the rope ladder up to the first platform and reality settled in, it was those words that kept my quivering legs going. Immediate panic overwhelmed me as I stood shaking at the top of the ladder. I knew I actually might not do this. I could have driven an hour, paid my fee, and climbed that ladder only to turn around and say I can’t. While the other eleven people in the group moved on to different platforms, tightropes, and nets, I fought back tears and an urge to turn and hightail it through the woods. It became a morning that wasn’t about teamwork. No one could make me do this but me. Could I cross nine squares floating in the sky like rocks in a stream? “Take one step. Just stand on that tiny square and see what it’s like,” I thought. “Good, now another.” I thought a lot of words I tell my kids not to say. I thought about my daughter and how I didn’t want to let her down. I had to do just one obstacle for her. I didn’t want to go home and say that I didn’t. It’s embarrassing to stand forty feet high, wiping the one tear that got away, struggling with a lifetime of never taking chances. I didn’t think about getting to the other side or how I’d get down. I thought about taking the next step. Walking these planks were about as hard as I’d imagine walking a pirate ship’s plank to be. It felt like hours, but I made it across. The only thing that kept me going after that was that I wanted to try the zip line, the way down from this madness. I had to go through two more obstacles to get there. This little zip line wasn’t so bad but getting to the pole at the other end and connecting my hooks to a safety wire caused great panic. Thankfully someone did that job for me. I hugged the pole. This was tough but quick. You can’t see the fear on my face. Almost at the end! Every muscle tense, my palms sweaty, my feet unsure, I did those too. “At least you conquered your fear,” my husband said on the way home. “Not really,” I said. Faced it maybe, but it still conquers me. “Well at least you’ll know what to do if you’re ever in that situation again,” he said. That’s so awesome that you were able to do that. I’m afraid of open heights too and would be a nervous wreck as well. You deserve a drink (or 6) for this accomplishment!! It was rough. I can’t tell you how many times I wanted to turn around, but I’ve always wanted to try something to overcome this. Just seeing people in situations on TV makes my palms sweaty. I’ll never sky-dive, never ride in a hot-air balloon, but I will say the zip line was awesome. I would do that again if I could find one that’s not too high. As a new mom this had me tear up so bad I almost couldn’t read! My 9 month old is becoming more and more a person every day and to think your 7 year old could motivate you to do something so life changing is breathtaking! I am excited for my little one to inspire me in the years to come. I applaud you on your bravery. I have always tried pushing myself passed the limits of my fears. Although I never made it much farther passed them it was extremely difficult breaching the barrier. Well done! As a mom, it’s really cool when you see your kids using the skills they’ve learned. She truly did get me through it and it was good to have something to fight for. Yay you! Congratulations on facing your fears and setting an unforgettable example for your daughter! It’s funny how something that terrifies me may be a piece of cake to someone else. That ropes course looks amazing to be, but turn those squares into spiders and you could hear me screaming from three states over. Yes, and it’s hard to be among others who feel that way too. Had we all be afraid of heights, maybe it wouldn’t have been so hard. I swear, some of those people were climbing that course like monkeys. But that’s what I try to tell myself when I’m around people with fears different than my own: I’m that way about heights. Well done – I could never do this (unless to rescue one of my children)! Oh, let’s just hope this was not a practice run for anything like that in my life! I would certainly not recommend this to someone afraid of heights, not knowing how deep their fear is. I couldn’t do it again. But for years I have wanted to try something in the way of facing this. Maybe that helped. As a fellow coward, I say WE’LL DONE! My family long ago gave up on me doing anything like that. I’m very proud of you. I keep threatening to do our local adventure park, but I fall off my own feet and cannot climb more than two stairs without major dizziness and nausea. I know TMI. But, YOU, major proud of you! I was amazed that I didn’t freeze up. It took a long time talking myself into every movement but I didn’t just freeze. I did worry I’d get dizzy. It’s happened before. Yeah, I can’t do balconies very well either. For this experience, I had to sit on the platform for a long time and adjust to the surroundings, which meant looking down and taking it all in. I had to get used to the height first or I couldn’t do it. My next adventure will be on the ground! Congratulations! You set a perfect example for your daughter by conquering your fear (though I’m not sure if she knew that you were afraid of heights). I love obstacle courses, but put me in a dark theme park haunted house, and I have a major freak out session. When I talked to her on the phone afterward, the first thing she said was, “Did you do it?” I would have felt awful if I’d had to say no. It felt good. The dark is a scary place sometimes. I especially don’t like being outside at night, thinking campgrounds here, walking alone to the bathroom. Spooky. I don’t think she knew the emotional effort I put in, but she was happy. If I hadn’t done it, she would have been disappointed. My daughter is young but she’s had to push herself a lot. I actually learn a lot from her. The adrenaline hit might become addictive. Congrats on your achievement whether it ends up being a once off or not. Oh I will never become an adrenaline junkie! Unless you count finding a great recipe the whole family will eat or getting to school without hitting any red lights. Thanks! I know what you mean. I do get disoriented easily and I’m sure that won’t change. Well done you. I am willing to bet you have a buzz out of having done it. Not that you actually want to do it again, but that feeling of having actually done it is pretty awesome. I felt that way after psyching myself up to give blood. The after-effect lasted ages and I got so much more done at work!! I can check it off my bucket list, so that feels good! Im for you, you manged to get the confidence to so that, more than I could my self, you earned some good brownie points! Wow! What a way to conquer your fears and think about your kiddos. I am dreading the days when my nugget (she’s only 14 weeks) has me pushed to my limits. I know we challenge ourselves daily to be better for our kids, but that was a major challenge. Nice work, Mama! I live in my comfort zone too. I am slowly coming out of it. Thank you for sharing. Yeah, my son saw the pictures and said I was a scaredy-cat and he loves to climb. All talk when he’s not hanging from two ropes! That is awesome!! High-fives to you!